Two John Jay students have earned national awards for their undergraduate research in science at national conferences that promote diversity and inclusion in STEM. Senior and Macaulay Honors College student Lisset Duran, who attended the Society for Advancement of Chicanos/Hispanics and Native Americans in Science (SACNAS) conference with a travel grant, won an award for her outstanding presentation of her research on the genetics of breast cancer. Dee-Anne Cush, who is a senior majoring in Cellular and Molecular Biology, won an award at the Annual Biomedical Research Conference for Minority Students (ABRCMS) on her presentation of immunology research she completed as part of Albert Einstein College of Medicine’s Summer Undergraduate Research Program. John Jay’s Program for Research Initiatives in Science and Math (PRISM) is committed to creating opportunities for students to learn science outside of the classroom. 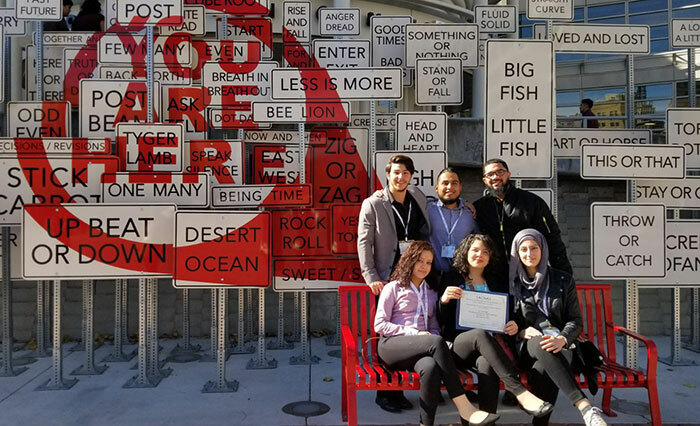 In November, Cush was one of seven students who attended ABRCMS in Phoenix, and Duran was one of six students to fly out to Salt Lake City in October for the 2017 SACNAS National Diversity in STEM Conference. In December, PRISM students also flew to Philadelphia to present their work at the American Society for Cell Biology Annual Meeting, where Duran again received special recognition for her research. In addition to gaining direct research experience under a faculty mentor, PRISM students like Duran and Cush also receive “bootcamp” style training to help them craft effective messaging for their presentations at the conferences. “When I first started working with faculty mentor Dr. Angelique Cortals, I wasn’t familiar with scientific jargon—it was all new to me. But I’ve been in PRISM for three years and I have improved tremendously in communicating and understanding science,” said Cush. Because SACNAS and ABRCMS have a specific emphasis on increasing diversity in science, they are or particular importance to John Jay’s students, many of whom come from backgrounds traditionally underrepresented in STEM. “SACNAS is very different from other conferences in that it’s focused on minorities, and it’s refreshing to be in a place where everyone looks like you,” said Duran, who spent her summer at Brown University conducting research as part of a paid internship with The Leadership Alliance. “As a black student in a predominantly white-male dominated field, it shows that there are opportunities for us out there,” said Cush. Dr. Edgardo Sanabria-Valentín, Associate Program Director of PRISM, agrees that diversity in STEM is a priority for John Jay’s community, especially since the College is a federally designated Hispanic-Serving Institution with 49% of its students identifying as Hispanic. “We at PRISM believe that science should represent the diversity that we see both in our beautiful city and across the world,” he said. Another important feature of the conferences is that both ABRCMS and SACNAS offer its participants preparation for graduate school. The SACNAS conference featured representatives from 400 different graduate schools as well as mentoring opportunities and workshops to receive individualized resume advice. For Duran, who is pursuing a PhD in biomedical science, and Cush, who has just applied to medical school, that information is crucial.